The Take-Control Diet aims to make you the expert on your body. Dr. Ian Smith delivers the final word on dieting for the fad-weary reader who wants the truth about permanent weight loss. 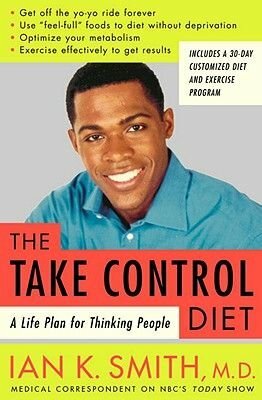 The Take-Control Diet explains the real science of how your body manages energy, why crash diets and trendy programs sabotage your chances of success, and how you can get off the yo-yo ride forever. Dr. Smith offers a diet and exercise program that allows you to eat without feeling deprived, or adopting an entirely specialized diet, and that helps you use both anaerobic and aerobic exercise for maximum weight loss results. He explains how to calculate your own individual food-and-exercise equation in order to lose the ideal amount of weight per week. The Take-Control Diet equips you with the facts so that you can approach your health and fitness goals psychologically fortified for the task. Understanding common myths about dieting will give you the knowledge you need to resolve your weight issues for good. Did you know that, contrary to the recommendations of many popular diets, eating too much protein could seriously damage your health? That it is impossible to convert fat to muscle? That starving yourself slows your metabolism and causes your body to store energy as fat? That no foods appreciably increase your metabolism? That chronic, yo-yo dieting makes weight loss increasingly difficult? Dr. Smith explains the causes of overweight, the health concerns of dieting, how metabolism and genetics factor in to weight control, and what you can do to work with, rather than against, your body's processes. Many diets dictate a program that might work--if it works at all--only as long as you can adhere to radical and unnatural habits. The Take-Control Diet, instead, equips you to design your own eating and exercise plan--one that accommodates your preferences, your daily routine, and your particular weight loss hurdles. Losing weight will not only help you look your best but also reduce your risk of heart disease, diabetes, and cancer--in addition to improving your overall energy level and ability to fight illness. Dr. Smith offers a plan, based on extensive research and his personal work with patients, that respects your intelligence and empowers you to win the battle with overweight. The Take-Control Diet is one hundred percent free of unrealistic promises, poor science, and far-fetched gimmicks--and one hundred percent yours for life.